Environmental, Health and Safety News: China is Now the World’s Largest Importer of Oil—What Next? Last month the world witnessed a paradigm shift: China surpassed the United States as the world's largest consumer of foreign oil, importing 6.3 million barrels per day compared to the United States' 6.24 million. This trend is likely to continue and this gap is likely to grow, according to the EIA's October short-term energy outlook. Wood Mackenzie, a leading global energy consultancy, echoed this prediction, estimating Chinese oil imports will rise to 9.2 million barrels per day (70% of total demand) by 2020. This trend has been driven by a combination of factors. Booming American oil production, slow post-recovery growth, and increasing vehicle efficiency have all served to reduce crude imports. In China, however, continued economic growth has brought with it a growing middle class eager to take to the road. While the automobile market had cooled earlier this year, September saw sales rise by 21%—a trend that is putting increasing strain on China's infrastructure and air quality in addition to oil demand. Some of the world's largest traffic jams are now commonplace in major Chinese cities, and air quality issues have pushed authorities to pursuesynthetic natural gas technology to offset the need for coal-fired electricity. Increasing oil consumption will only serve to exacerbate these issues. Furthermore, the per capita consumption differential between the two countries is still vast, with an average Chinese citizen consuming a mere 2.9 barrels of oil per year compared to an average American who consumes 21.5. 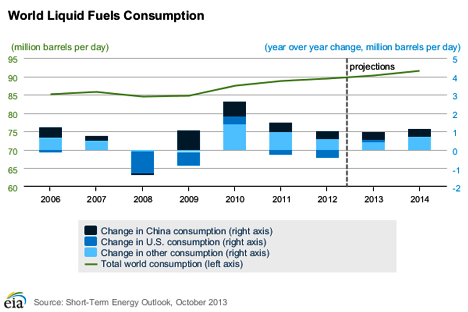 This indicates that China's growing thirst for oil isn't going to slow down anytime soon.